A Chicago lawyer on Monday filed a class-action lawsuit in response to a proposed settlement of tobacco litigation that would restrict the rights of Illinois residents to recover damages for tobacco-related illnesses. Kenneth B. Moll filed the class action in Cook County Circuit Court on behalf of an estimated 3 million state residents who have died or suffered from tobacco-related illnesses. The lawsuit is the first class action against the tobacco industry to be filed in a state court, he said. Moll said the suit was filed in reaction to a $368 billion settlement agreement reached last month by the tobacco industry and attorneys general from 40 states, including Illinois Attorney General Jim Ryan. The settlement, if approved in its present form by Congress and President Clinton, would deny potential plaintiffs their constitutional right to full recovery for tobacco-related illnesses, Moll said. "We're not opposed to the attorneys general reaching a settlement with the tobacco companies for medical costs that need to be reimbursed, but it should be a settlement that doesn't affect the individual rights of smokers to seek full compensation for their tobacco-related illnesses," he said. Moll said the objectionable terms of the settlement agreement include a ban on class-action lawsuits and punitive damages and a cap on compensatory damages. "There are simply too many provisions in this settlement that would allow big tobacco companies to continue to rack up huge profits and continue to manufacture and sell dangerous products, while severely restricting their victims' rights to legal redress," he said. Requiring the more than 3 million potential plaintiffs in Illinois to file individual lawsuits for damages, rather than a class action, would be an “unmanageable burden on the judicial system," Moll said. He further charged that the settlement's proposed ban on punitive damages would undermine the potential plaintiffs' rights of due process, while setting a "dangerous precedent" for other industries that make and sell dangerous products. "To eliminate punitive damages in light of all the documentation and proof that we now have against the tobacco industry would be a slap in the face to millions of victims who have suffered and continue to suffer a a result of the defendants' wrongful conduct," he said. The 24-count lawsuit names 32 defendants, including tobacco manufacturers, distributors, wholesalers and industry groups; there are 17 named plaintiffs. 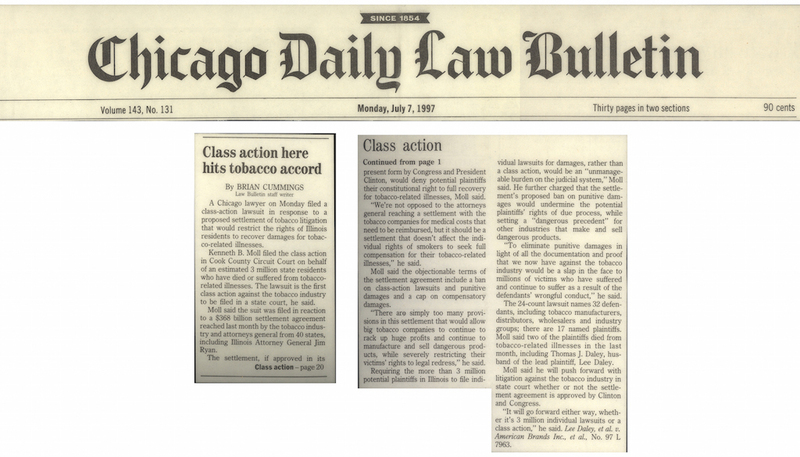 Moll said two of the plaintiffs died from tobacco-related illnesses in the last month, including Thomas J. Daley, husband of the lead plaintiff, Lee Daley. Moll said he will push forward with litigation against the tobacco industry in state court whether or not the settlement agreement is approved by Clinton and Congress. "It will go forward either way, whether it's 3 million individual lawsuits or a class action," he said. Lee Daley, et al. v. American Brands Inc., et al., No. 97 L 7963.